Though it's not politically correct these days to say it, the continuing refinement of the rifle may be among the greatest achievements of the United States. Not simply because it has become more advanced and lethal over the centuries, though it has certainly accomplished that, but because of spillover effects which include the propagation of industry, engineering, craftsmanship and invention. And, controversially to some, it's role in promoting freedom in the hands of the American soldier. Alexander Rose explores the story of the rifle in American Rifle: A Biography, perhaps one of the finest examples of a concise, pleasing and informative recounting of this technology's past, present and future and the web of connections it has to all aspects of American society. Utilizing primary sources and firsthand accounts, Rose illustrates how quintessentially American the rifle really is. Given America's melting pot, it shouldn't be surprising that the rifle's origins actually begin in Germany where they were the province of wealthy hunters. Brought to America by early German settlers to Pennsylvania, they were responsible for ultimately became known as the Kentucky rifle, allegedly so named because of Daniel Boone's preference for them when traveling in the frontier areas. They were bespoke in nature, each handcrafted by tradesman for specific purposes. As technology progressed so did the rifle, a largely unbroken line which stretches from the flintlocks used during the American Revolution, World War II's M1 Garand, the M16 of Vietnam and its cousin the M4 now seen in Iraq. It wasn't a smooth transition, Rose reports, and features a number of dead ends on its evolutionary tree – often a result of ideology or lack of foresight. It's often said that generals "fight the last war" but American Rifle makes it clear that their soldiers sometimes do it with rifles from the last war. For nation so inextricably tied to the rifle, it's a shock to learn how many times America's soldiers have marched into battle with substandard arms. As Rose shows, the rifle spawned a number of philosophical debates, some of which lasted for centuries. Though the era of armies firing muskets in volleys was disappearing, many officers still demanded the ability to control exactly when each soldier fired. Military leaders saw the rifle as a problem as it allowed soldiers to fire more quickly, thereby forcing armies to carry more ammunition. Up until this century it was also debated whether American soldiers should be sharpshooters carefully firing each round or should they lay down a brutally suppressive fire to hopefully wipe out the enemy. That America and its history are intimately intertwined with the story of the rifle is hardly a new contention. It has, however, often served as the starting point for ideological screeds typically attacking firearms and the United States itself. Rose could easily have succumbed to editorializing on either side of the firearms rights issue but instead American Rifle engages the subject thoughtfully and neutrally, allowing the reader to draw their own conclusions. This is one of those rare efforts which doesn't use history as hammer, but as a magnifying glass. There have been many other efforts chronicling the history of firearms, and specifically rifles, in the United States but few are as enjoyable and compelling as American Rifle. The rifle is, as Gen. John J. Pershing stated, "distinctively an American weapon" and it has a history as grand as the nation that spawned it. 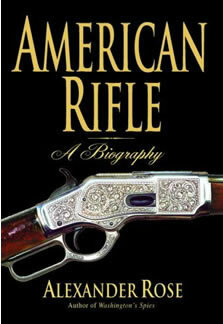 Thanks to Rose it in the form of American Rifle also has a biography worthy of it.